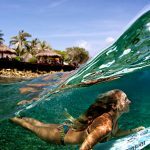 Are you looking for a gorgeous vacation spot that provides a great setting for relaxation where you can also surf the local breaks? 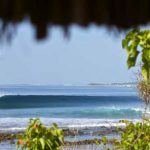 If this sounds like the perfect destination vacation, then you’ll want to check out Hudhuran Fushi, a four star resort found on the island of Lohifushi — home of Lohi’s, a fun left hand point break for all types of surfers. 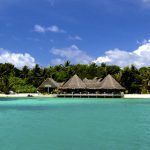 Lohifushi is a small isolated island that’s perfect for anyone that doesn’t want to deal with throngs of tourists. 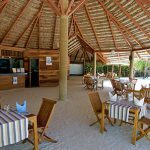 You’ll have no trouble relaxing here due to the peaceful and quiet atmosphere that Lohifushi is known for. From the Male International Airport, it is about 30 minute ride by speedboat. This beautiful tropical haven has white powder beaches, crystal clear waters, and a continuous warm breeze. Perfect for surfing couples, honeymooners, or families, there is world-class surfing making it the perfect surfer retreat. The resort and the island itself are known for its’ incredible surfing. Its local break is a left hander called Lohis. It’s a world class wave that peels perfectly from outside to the inside offering nice walls for manouevres and when it’s big, some very nice barells. Lohis is a fun wave that surfs very similar to Pasta Point — and is pretty consistent regardless of the tide. The best time to surf Lohis is usually during the peak south east swells that roll in from May to October — bringing head high to double overhead surf. The surfing here is much more intimate due to the fact that boats do not have access to the spot and the capping of on-island surfers. Residents of the island must have a surf pass to gain access to the spot as well. If you want to get out and explore the island, attendees can take one of the several mini tours for around $50 (start at 3 hours) in order to discover other waves of the northern atoll of Male. The four star resort ensures that its visitors are able to receive the rest and relaxation they are looking for by limiting the number of guests to 45 at a time. This also ensures that if you’ve come for the surf, you will only have to share the waves with your fellow resort goers. The resort also provides its guests with access to an outdoor pool and a stunning lagoon. There are two types of villas that you can stay at: the Lohis Villa and the Beach Villa. 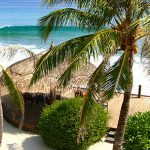 Lohis Villa – Lohis villas house one to two people and can be found right next to “the spot,” which is the area designated for surfing. They boast air conditioning, a fan, a sitting area, a safe and either a double bed or two single beds. Amenities include a garden view, cable TV, satellite TV and a telephone. All-inclusive rates, which cover food, drinks, alcohol, and taxes starting at just $233 a person. Beach Villa – Beach villas house between one and three people and are located nearby the lagoon and roughly 10 minutes away from the spot. Beach villas have air conditioning along with a terrace, a fan, a sitting area, a safe and either a double bed or two single beds and the ability to add a single bed. Amenities include a sea view, satellite TV, cable TV and a telephone. All-inclusive rates, which cover food, drinks, alcohol, and taxes beginning at just $255 a person. 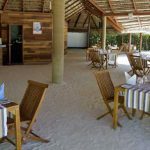 If you’ve got some vacation time coming up and are looking to relax out in the sun on beautiful beaches while also surfing some of the best waves you can find, then you should strongly consider booking time at Hudhuran Fushi. Just keep in mind that there’s a minimum stay of 6 nights and a limit of 45 surfers, so book ahead of time! To book – click here!